In honor of that most noble of American pastimes, a lovely painting inspired by a favourite photo of the great San Francisco character, Lefty O’Doul … otherwise known as Mr. Lefty not-yet-in-the-damn-Hall-of-Fame O’Doul. 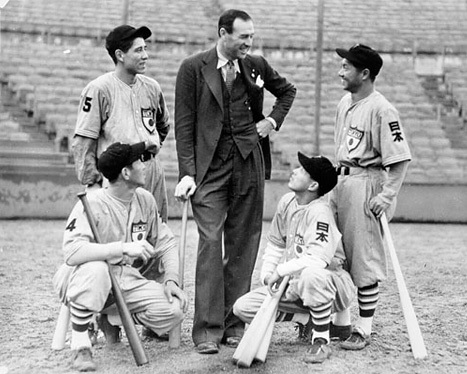 If you’ve heard my podcast about Lefty, you’ll have guessed that this photo was taken on one of Lefty’s famous tours of Japan — a preoccupation which would eventually earn him a second nickname, “the Father of Japanese Baseballâ€. As to the source of nickname number three, well — take a look at the painting! Thanks to his signature garment, Lefty was known throughout San Francisco as “the Man in the Green Suit”. I was tipped off about this painting by an inquiry (on behalf of Chris Felix) about the precise shade of Lefty’s infamous green suit, and the source of the photo on the Sparkletack website. Since I was only about three years old when Lefty passed, I wasn’t much help with the sartorial question — but the photo was found in the amazing online collection at the San Francisco Public Library. A few weeks later, Lefty’s cousin Tom O’Doul dropped me a line letting me know that the painting was actually here in San Francisco. Thanks Tom! It will be on display at the George Krevsky Gallery in Union Square until June 20th, 2009, as part of their 12th annual baseball exhibition. I hope all baseball fans of “Lefty” will view the wonderful work of Chris Felix at the George Krevsky Gallery. The baseball exhibit is a must see for any fan of the game. 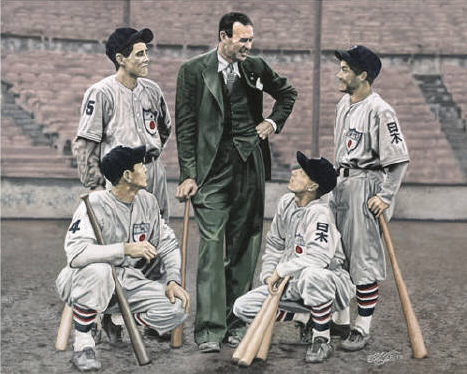 I do believe the original photo was taken at Seal’s Stadium with visiting Japanese players in 1935. I miss the SF history podcasts.What happened? Been waitin for the Palace Hotel cast you mentioned in the Caruso/06 quake story. Have you move to Portland and so no longer do Sparketack? I second the opinion of Michelle Drake. I have eagerly listened to all of your podcasts, including all the archived material. I am a fourth generation San Franciscan and have learned many things even I had never heard of (or my mother either, a third generation San Franciscan!) Please do come back; we miss you. Hi richard I seem to have missed something. Where are you. What has happened to those fantastic pods. please let me know. Awe the best from Scotland. I m missing all of that stuff…. do tell us what has happened? Your podcasts are a popular topic in our sauna next to Hyde Street Pier. Has home brewing consumed your spare time? I live near SF Brewcraft here in the Richmond. How about a show about brewing in SF and the bay area. I remember that Sonoma (Hop Kiln) was once an important hop growing region before Yakima. Hi guys … sorry for the sudden absence-without-explanation, but frankly — I just ran out of gas. Writing and producing this show is a thing greatly demanding of time and energy, and what fuels me — and pretty much every podcaster/blogger — is feedback. There are thousands of folks out there listening to me, but I just don’t hear from them much. In the absence of that kind of external encouragement, I decided to take a little time off, wait for my batteries to recharge, and start working on Sparkletack again when circumstances tell me the time is right. Never fear, though … I will be back. I have been listening to your wonderful Sparkletack podcasts in my car. As a native San Franciscan, and there seems to be so few of us around the Bay Area, I am enthralled with your musings. I learn more and more of my hometown with every Sparkletack podcast. Hopefully your time-off will not be too long. You have done a wonderful job. As an FYI, my father was a US Navy civilian worker on Treasure Island for many years. Your multi-part podcast on the island’s history put into perspective many of the sights I have seen there. Here’s from one avid fan just waiting for your return. I hadn’t heard about the green suit nick and neither about Lefty being the father of Baseball in Japan. Lots of fun, your blog is a wonderful pastime, thanks! ALL OF YOU OUT THERE IF YOU READ THIS. COME ON WE CANT LET THIS FANTASTIC SITE JUST DRY UP. SEND RICHARD A MESSAGE.TELL HIM WE WANT HIM BACK.DO IT ,NOW. LOVE BILL. Love your blog! I always read it when im at work, its a good timepass! Thanks alot! Keep up the good work, hope u’ll be back soon! Hi Richard just thought I would say hello. Hope you and your’s are all well. What are you up to?. It will soon be Christmas again. Time fly’s when you are having fun.Hope to hear from Sparkle soon. Till then awe the best fae Scotland. Do you know the old story about Lefty O’doul later in life, attending an allstar game long after his managing career was over? It goes something like this: (I’m not quoting here) He’s sitting in the stands and a reporter see’s him. The guy thinks: hey, Lefty’s always good for a pithy quote or two. So he walks over and says, Hey Lefty, how would you compare these guys (the allstars on the field) to the guys you played with? Lefty says something to the effect of: these guys (the modern major leaguers) wouldn’t even have started on our minor league squads. Still digging for gold, the reporter, says, well then in your opinion who was the greatest player you ever saw?” Lefty thinks about this a minute and says: well when I was a kid I saw Ty Cobb, he was the best. The reporter says: how would he have done in today’s game? Lefty thinks about this for a minute and says, he would have batted .300, hit 21 homers and driven in 90 runs. The reporter says, Huh. It’s funny you should say he’s the best you ever saw, those are good stats but there’s plenty of guys putting up those kinds of numbers today. Lefty says, yeah but you got to figure… he wouldn’t have beat out all those infield hits, for christ sake if he was playing today he’d be 80 years old! @ Kirk Lombard: I admit it – I laughed out loud when I read that story. Great one, really captures Lefty’s sardonic sense of humor. Thanks for sharing it! My father, George H Richards M.D., was Lefty’s first cousin. His mother, my Grandmother, was Mary Frances Adoul (the name was later changed from French to “Irish”). My dad met Joe D and Marilyn M right before they all left for the All-Star game in Japan (also Joe & Marilyn’s honeymoon)! My mother is still here to tell the story! hey I just did a portrait of O’Doul for the San Fransico Baseball Art Show at the George Krevsky gallery this spring.